Telemachus: Did President Obama Ever Run a Lemonade Stand? That is pretty much it, ladies and gentlemen. 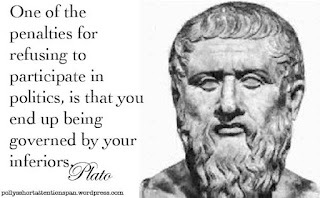 We have always had the debate in our national elections over more or less 'control' from a centralized authority in Washington starting with the debates in the Constitutional Convention in Philadelphia in 1787. This one, however, goes far beyond just what the 'proper role of government' should be in America. This election fundamentally comes down to whether you believe that all freedom, all prosperity, all benefits in America comes primarily from our government or from private people making decisions on their own every single day. President Obama represents a major change from virtually every other American President in our history in his outlook on free enterprise and capitalism. His actions, policies and words over the past 3.6 years as Chief Executive have skewed heavily towards the notion that he believes the federal government is the 'be-all/end-all' when it comes to bestowing favors and blessings on the American people from Washington. His every utterance oozes with the notion that anyone who succeeds in America must have done something 'wrong' to have succeeded somehow. He views every business as a conduit for more redistribution of benefits and programs as dictated by his Administration and friends in Congress. The notion that businesses exist primarily to provide a return on investment for the owners and shareholders seems to bounce off of him like a rubber ball. He views business with disdain as he describes the 'failed policies of the past' under Bush, Clinton, Bush 41 and Ronald Reagan when a total of close to 50 million new jobs were created in America as 'trickle-down economics'. He has vowed to never allow the United States to return to 'those days' which were nothing but loaded with heady job growth for the most part of the last 30 years. Based on the anemic record of the past 3.6 years under his leadership and ideas, it appears as if he has 'succeeded' (sic), hasn't it? We are not returning to those days of rapid economic job growth any time soon under the policies he has espoused and passed, right? Here's our question: If financial prosperity doesn't flow from the top down in business, what is the opposite that President Obama would like to see....Trickle-Up Poverty? If President Obama is given another four years in the White House, we don't see him changing his spots one bit as Bill Clinton did in 1994 after having his head handed to him in the mid-term elections by the Republicans who took control of Congress for the first time in half a century. Don't laugh. This is a serious question. 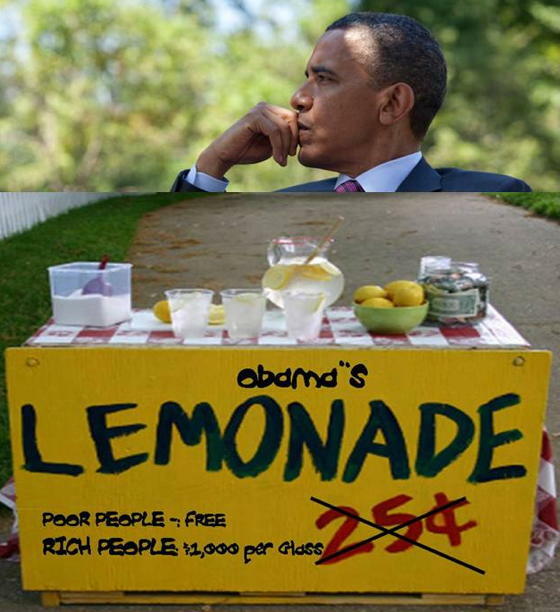 Did President Obama ever run a lemonade stand growing up in Hawaii? The reason why we ask is that we know that private enterprise is very hard work. Very hard, challenging and financially risky work on a daily basis. If you have ever run a lemonade stand at a very young age, you learned what it takes: planning to get the supplies for the lemonade; finding the right place to set up the stand; getting people to stop to buy your lemonade (marketing/promotion) and then worrying about whether you made enough money to do the same thing again the next day and the next and the next. We looked outside and he had 'recruited' 2 of his brothers and a couple of friends to run the business while he was inside the air-conditioned house. 2 were manning the stands, selling the product and making change for each transaction; 1 was down around the corner with a sign 'directing' people to the 'Best Lemonade Stand in the Universe!' or something like that and the others were fanning out through the neighborhood knocking on doors asking people to come to the lemonade stand and buy a pitcher or two. That was hard work. And he made $20 that day. $20. For selling homemade lemonade. Paid his brothers and friends $10 or so and made $10 profit for himself to keep and plow back into his business for the next time around. His brothers and buddies got paid so they were happy. Our son covered his costs and made a profit and was happy. What the heck is wrong with that? That is a microcosm of how every business works in America or anywhere else free enterprise is embraced and allowed to flourish in the world. If you don't understand that or appreciate it, you have no chance of understanding how we can get this nation back on its feet and moving ahead where everyone can benefit. The 'government' (paid for by the taxes paid on the profits earned by that businessman/woman) did provide the roads on which people could travel in a car to get to that lemonade stand and the sidewalks on which the lemonade stood. But that was it. What our son earned that day was the result of his own creativity, his own gumption, his own salesmanship and his own risk-taking personal profile. He 'shared' his creativity and energy with his brothers and friends by 'paying' them for their work which they loved because they went to the 7-11 immediately and bought a bunch of Cherry Cola Slurpees. Our 'guvmint' is paid for by YOUR taxes! You OWN this government! No one else 'owns' it or 'runs' it. You get to tell the Guvmint what to do each and every time you vote in ANY election! 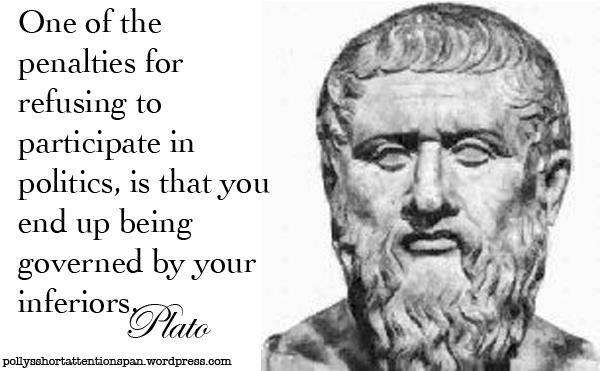 If you want more of it (government), work to elect people who will provide it for you. If you want more freedom and less government, then you have to work your fanny off to get them elected so you won't have your business swamped by more taxes and regulations. So our friend got up every morning at 4:30 am and delivered a couple of hundred newspapers every day for 3 years of high school. When everyone else was sleeping. Many of us laughed at him and kidded him about being 'just a newspaper boy!' while the rest of us were trying to be cool or popular or whatever. He drove a brand-new 1972 silver Camaro during high school. No one else did (unless the more financially well-off kids had their parents hand them a new one for some reason). He rose quickly after college to become the vice-president of marketing for a very large international telecommunications corporation before the age of 35. Delivering those newspapers and collecting the bills every month served him well. Here's our point: We sure would feel a lot better if we had ever heard one story from President Barack Obama when he was known as Barry Soetero as a youth about him selling lemonade from a lemonade stand in Hawaii or delivering papers wherever he was living in high school. At least we would know for sure that President Obama truly understands what it takes to run a business, meet a payroll and also pay large amounts of taxes to keep the rest of the country going. This election is all about whether we continue on the path towards more government intervention in our nation's business or whether we stop and make almost a U-turn back towards more personal freedom in the marketplace and workplace. You get to make the choice this fall between the Obama/Biden incumbent team and the Romney/Ryan team. So choose wisely. Our future is depending on it.